Okay, for a second, let’s all just have a moment of silence in remembrance of Nick Jonas’s bachelorhood - because he’s officially wifed up!! 😭😭😭 My heart is a litttttle broken, but at the same time, he literally could not have had a more perfect bride become his wife. Priyanka was stunning, to the point that we’ve almost all but forgotten what it was that her mummy-to-be bestie wore on her own May wedding day. ((Kidding, we still have those custom Givenchy and Stella looks permanently locked in our memory)). But in all honesty, Priyanka and Nick came pretty damn close to a stateside (not literally, India is where this one went down) royal wedding of their own. And we’re not over it yet, either, we’re farrrr from being double-tapped out. All this being said, as more details emerge about the couple’s multi-day marital lovefest (will be on stands in PEOPLE tomorrow), and from what we’ve seen already, we’re completely and entirely obsessed. They might just be our 2018 #weddinggoals winners, actually. 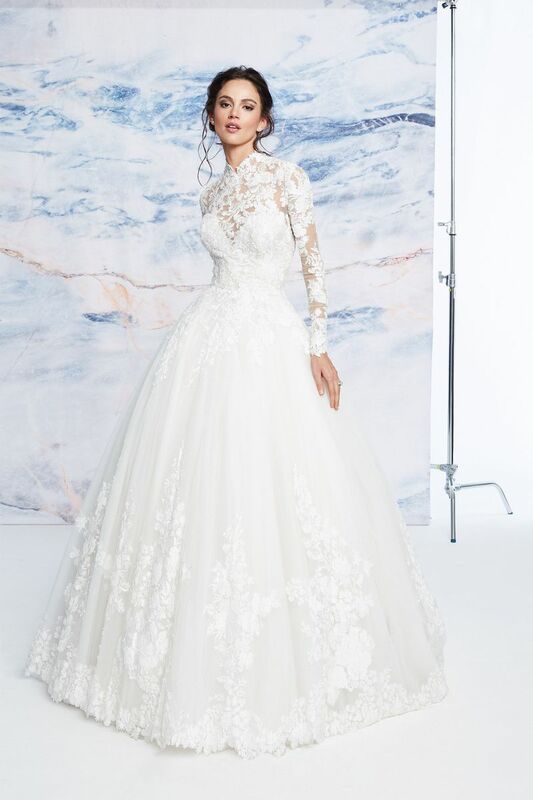 I pretty much died when I saw the first pic of Priyanka’s gown for the Christian ceremony post this morning, because the look was a serious departure from what the new Mrs. Jonas said her dress would be when she shared some tidbits last month. Cute and comfy? Hmm. Not exactly, but that’s okay, we’d say we were satisfied with her custom Ralph Lauren haute couture gown - understatement of the year. And TBH, it’s not tooooo far off from anything we predicted she’d slay in. Satin-covered buttons down the middle of her hand-beaded, hand-embroidered tulle appliquéd high-neck coat... kind of a signature look for the actress, right? Not to mention all that sparkle. Between the Swarovski crystals, mother-of-pearl paillettes, and crystal seed beads dazzling on her bodice and the 2,380,000 mother-of-pearl sequins glittering on her column gown underneath, Priyanka was a modern, glistening angel and princess… ‘once upon a fairytale,’ to be exact. When you add to that the fact that Ralph hand embroidered the overlay with meaningful words and phrases curated by Chopra - including “family,” “hope,” “compassion,” “love,” as well as her husband’s full name, their wedding date, a fitting Hindu mantra, and her parents’ names - you end up with a gown that everrrrrrry bride is going to take inspiration from. 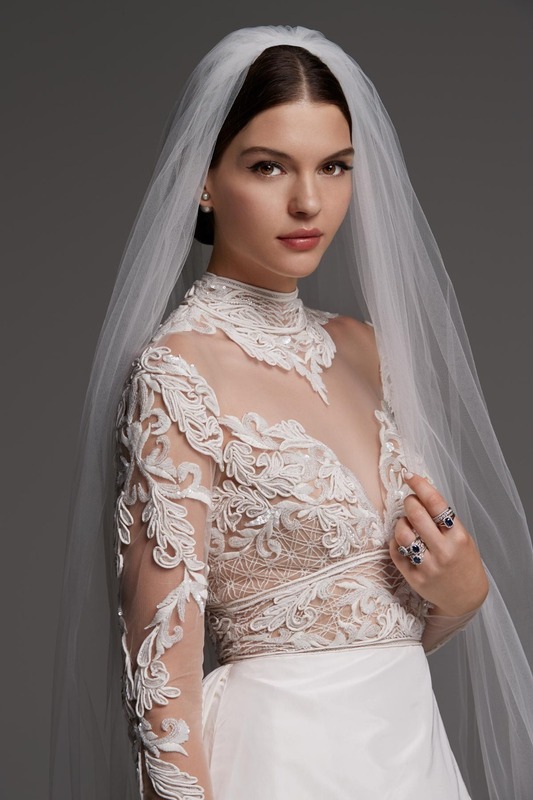 From embroidery/lace floral tattoo-effect-enthusiasts to sparkle queens, vintage lovers to modesty mavens, both trendy and traditional brides have something to love about this look. Especially if they’re ALL about family like the newlyweds are. Priyanka had a piece of her mother-in-law’s lace wedding gown sewn into her dress. If that’s not a way to show your new mama some love, then we don’t know what is! Since Priyanka’s gown is so unique, and truly, Ralph Lauren has only ever designed custom wedding day fashions for his own family, we had trouble finding too many spot-on matches. 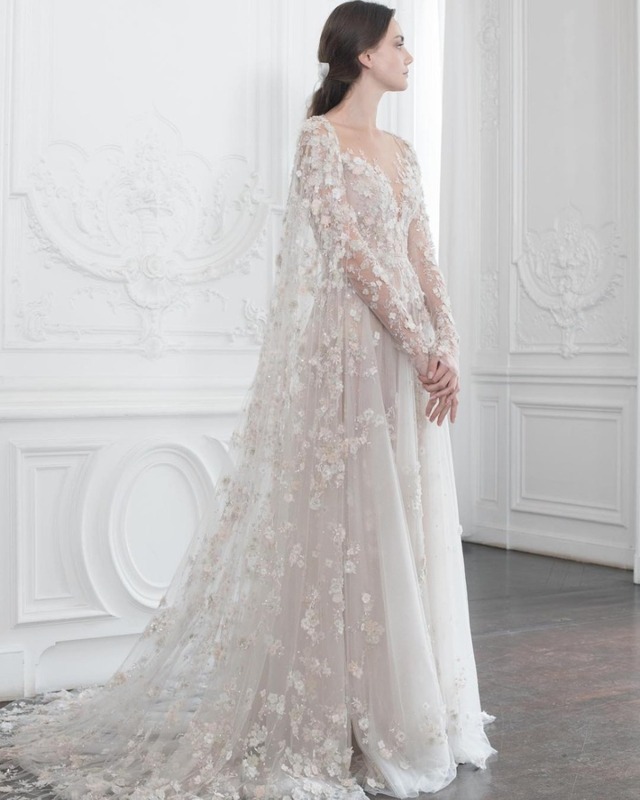 But these are still 👌, specially when you consider their features and how PC-inspired they are: rich embroidery, illusion sleeves, a high neck, and sheer overlay details. …. Be on the lookout for a post soon on the most dramatic trains ever. We’ve already covered statement veils and bridal capes, after all!